Mechanistic investigation of PLQY in Cs2Ag1−xNaxInCl6. a) Transition dipole moment (µ) in Cs2Ag1−xNaxInCl6 as a function of Na content in the system. b) Parity change of the electron wavefunction of the STE before and after Na incorporation (pure and alloy). The cyan and magenta isosurfaces indicate electrons and holes c) Configurations showing strengthened STE confinement by the surrounding NaCl6 octahedra. d) STEs in Na-rich Cs2Ag1−xNaxInCl6. The STE is located in two neighboring octahedra. e) Configuration coordinate diagram of the STE formation in Cs2NaInCl6 (inset). Credit: Nature, doi: https://doi.org/10.1038/s41586-018-0691-0. One-fifth of global electricity consumption is based on lighting; efficient and stable white-light emission with single materials is ideal for applications. Photon emission that covers the entire visible spectrum is, however, difficult to attain with a single material. Metal halide perovskites, for instance, have outstanding emission properties but contain lead, and therefore yield unsatisfactory stability. A new report published by Jiajun Luo and co-workers details a lead-free double perovskite that exhibited stable and efficient white light emission. 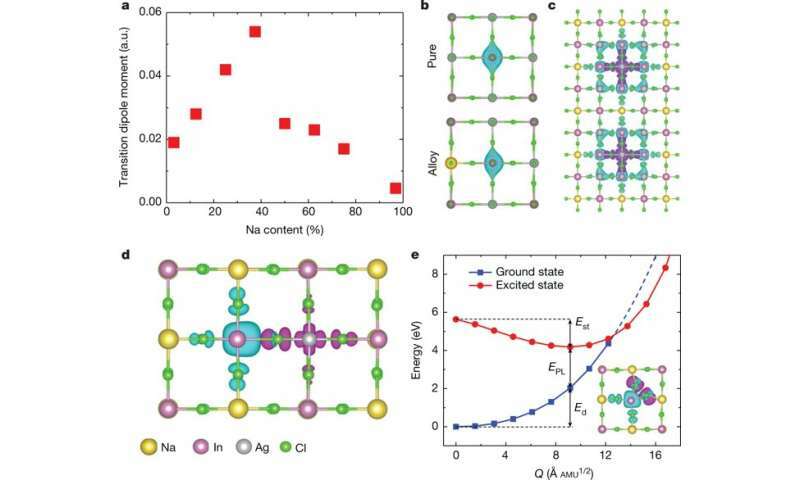 In its mechanism of action, the material produced self-trapped excitons (STEs) due to Jahn-Teller distortion of the AgCl6 octahedron in the excited state of the complex, observed when investigating exciton-phonon coupling in the crystal lattice. The results are now published in Nature. White light emission from a single emitter layer is of interest in lighting applications due to its simplicity compared to multiple emitters. Typically, broadband and white light emissions originate from self-trapped excitons (STEs) existing in semiconductors with localized carriers and a soft lattice. The authors focused on the double perovskite Cs2AgInCl6 as a promising material that emits warm white light due to its broad spectrum and all-inorganic, lead-free nature. 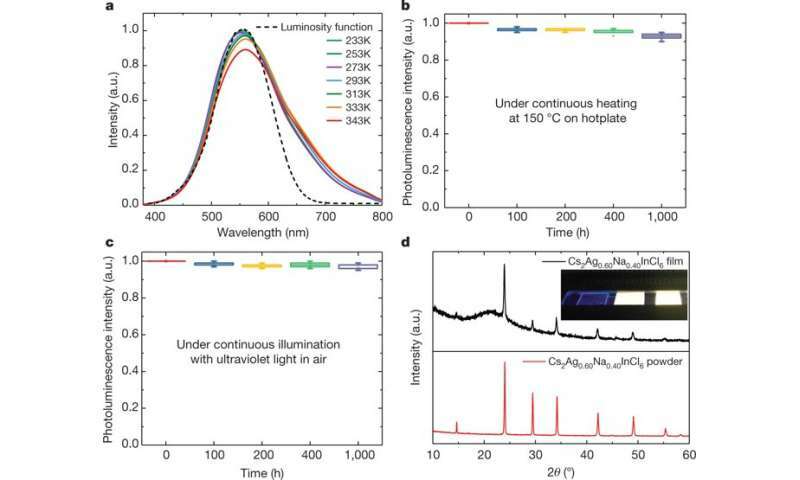 The study optimized the alloy to form Cs2(Ag0.6Na0.4)InCl6 with a small percentage of bismuth doping to emit warm white light with increased quantum efficiency for more than 1000 hours. Materials for lighting applications can be defined as those emitting a "warm" white light for indoor applications and "cold" white light that approximates the visible region of the solar spectrum. In the study, Luo et al first sought to understand the origins of broadband emissions in Cs2AgInCl6 using mathematical modeling and computational studies to relax the lattice and represent self-trapped excitons (STEs) to investigate exciton-phonon coupling. Such systems will be fundamental to engineer the next generation of energy-efficient and cost-effective lighting and display technologies. A self-trapped exciton (STE) is defined as a bound electron-hole pair carrier that can dramatically enhance luminescence, energy transport and lattice defect formation in the crystal. 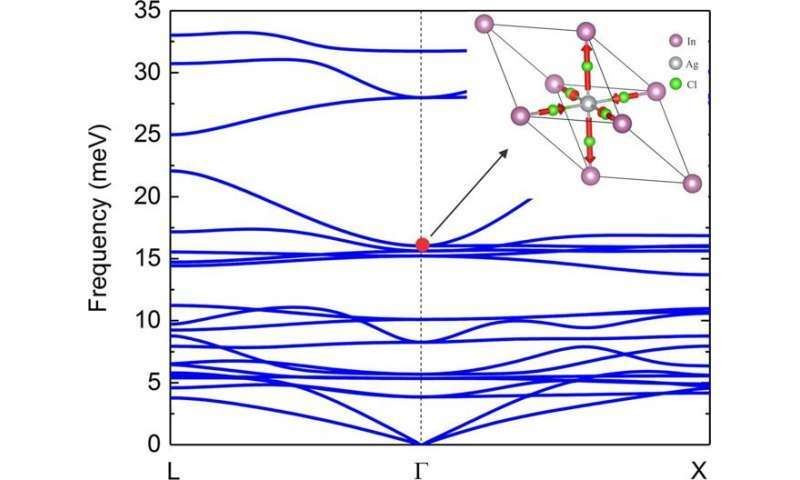 The researchers found that STEs in the double perovskite Cs2AgInCl6, arose from strong Jahn-Teller distortion of the integral AgCl6 octahedron complex. The trapped excitons had a similar orbital character to the free exciton, indicating parity-forbidden transition (arising due to disruption of the centre of symmetry). The theoretical analysis showed an extremely low photoluminescence quantum yield (PLQY) for pure Cs2AgInCl6. To enhance the PLQY for practical applications as broadband materials, the system had to be modified, specifically by breaking parity-forbidden transition to manipulate the symmetry of the STE wavefunction. White light emission from Cs2Ag1−xNaxInCl6. a) Luminosity function (dashed line) and photoluminescence spectra (solid lines) of Cs2Ag0.6Na0.4InCl6 measured at different temperatures from 233 K to 343 K. b) Photoluminescence stability of Cs2Ag0.60Na0.40InCl6 against continuous heating on a hotplate, measured after cooling to room temperature. c) Operational stability of Cs2Ag0.6Na0.4InCl6 down-conversion devices measured in air without any encapsulation. The boxplot showed the results for the different samples measured separately with the box edges representing quartiles and band in the box representing the mean and maximum data. d) XRD patterns of a Cs2Ag0.6Na0.4InCl6 film (black line) and powder (red line). The inset shows a 300 nm thick quartz substrate and 500 nm thick Cs2Ag0.6Na0.4InCl6 films under 254 nm UV illumination. Credit: Nature, doi: https://doi.org/10.1038/s41586-018-0691-0. Since lattice mismatch between the two perovskites (Cs2AgInCl6 andCs2NaInCl6) was very low (0.3 percent) the scientists anticipated Na+ incorporation would occur without detrimental defects or phase separation. For the synthesis, CsCl, NaCl, AgCl and InCl3 precursors were mixed into an HCl solution in a hydrothermal autoclave. The mixture was heated for a defined period of time and cooled down to result in a final white precipitate product (90 percent yield). The pure double perovskite phase was confirmed using X-ray diffraction patterns (XRD) of a series of product compositions. The results agreed with plasma optical emission spectrometry (ICP-OES). The results were also in agreement with similar alloying experiments that were previously conducted with lithium (Li). The study thus suggested a general trend for alkali-metal-induced photoluminescent enhancement in double perovskites. Photoluminescence spectra were recorded for a series of product powders by varying the temperature of the measurements. The authors optimized the Na content alongside bismuth (Bi3+) doping to improve the crystal quality and slow cooling to obtain the highest PLQY (85 ± 5 percent) recorded thus far for white-light-emitting materials to form the optimally alloyed Cs2Ag0.6Na0.4InCl6 in the study. Characterization of Cs2AgxNa1−xInCl6 with different Na content. All samples were doped using a small amount of (0.04 percent) Bi and the composition determined using ICP-OES. a) XRD patterns of Cs2AgxNa1−xInCl6 powders with different Na content were obtained. The Asterix marks the (III) diffraction peak, θ diffraction angle and au - arbitrary units. b) Optical absorption (solid lines) and photoluminescence (dashed lines) spectra of pure Cs2AgInCl6 and Cs2Ag0.6Na0.4InCl6. c) Activation energy and PLQY of Cs2AgxNa1−xInCl6 powder vs. Na content. The dashed lines guide the eye. d) Excitation spectra of photoluminescence measured at different wavelengths. e) Emission intensity vs. excitation power for Cs2Ag0.6Na0.4InCl6. f) Transient absorption spectra for Cs2Ag0.6Na0.4InCl6 (laser pulse of 325 nm), ∆ A/A is optical density. The irregular peaks located at ~650 nm is from frequency doubling of the pumping light. Credit: Nature, doi: https://doi.org/10.1038/s41586-018-0691-0. 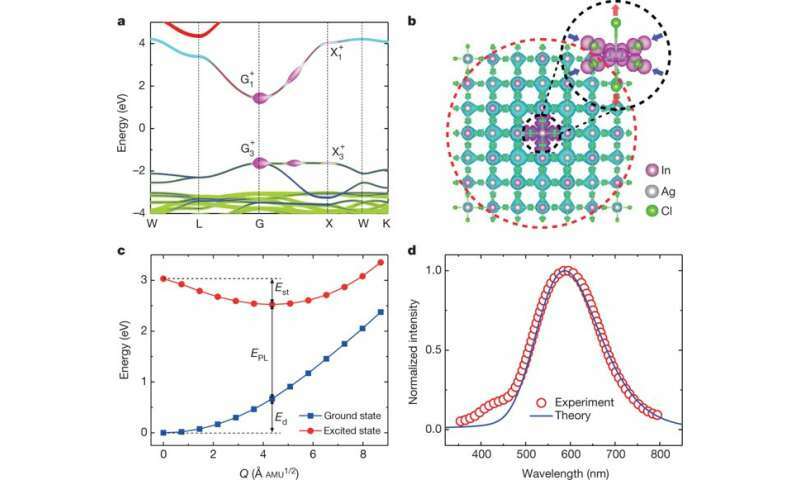 Photoluminescence excitation (PLE) spectra confirmed STE origin of the white emission to experimentally confirm the calculated time-scale of exciton self-trapping. The Na perovskite (Cs2Ag0.6Na0.4InCl6) exhibited linear dependence on the photoexcitation power. Additional theoretical tests were done to understand how PLQY varied as a function of the Na content. As the Na content increased, the transition dipole moment increased and then decreased to support the composition-dependent PLQY observed in the study. The electron wavefunction of the STEs was also compared before and after alloying with Na. Incorporating Na broke the inversion symmetry of the Cs2AgInCl6lattice, changing the electron wavefunction at the Ag site from symmetric to asymmetric. Two factors contributed to the decrease in PLQY on further increase of the Na content. The first was orbital overlap between electrons and holes of the STEs upon increased Na content. The second reason for the observed decrease in PLQY with increased Na was due to increased non-radiative loss in the Na-rich alloy. A key challenge for lighting applications is the parameter of emission stability. The Cs2Ag0.6Na0.4InCl6perovskite showed stable emission in the study with little emission degradation. When the powder was annealed to a hotplate, only minimal photoluminescence decay of the white emission was observed, the authors proposed that the observations may be due to strongly bound excitons and a nearly defect-free lattice that prevented photoluminescence quenching while resisting thermal stress. In this way, the scientists presented a new strategy to produce broadband emission associated with the STEs for single-material based white-light electroluminescence, allowing prototype double-perovskite based electroluminescence device formation. To increase electroluminescence performance in the future, further research should focus on optimizing the emitting-layer quality of the Cs2Ag0.6Na0.4InCl6 films. 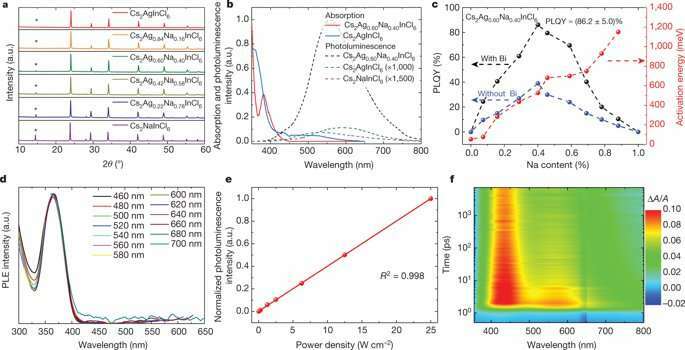 The study showed that alloying Na into Cs2AgIn Cl6 broke parity-forbidden transition as anticipated to reduce its electronic dimensionality and enable efficient white light emission via STEs. The white light emitting material also demonstrated low cost manufacture and exceptional stability as a promising solid-state lighting platform. The authors believe that such halide double perovskites hold great possibility for applications in display and lighting after further study to realize their full potential. The results will stimulate research on single-emitter-based white-light-emitting phosphors and diodes to generate the next-generation of lighting and display technologies. Cesium silver Indium chloride???? I suspect that this may be a tad spendy for lighting applications. Maybe if most cities in the West didn't still use lighting fixtures designed ithe 1960's which bleed light up into the sky (light pollution) and replaced them all with efficient, directed sources it wouldn't be so wasteful? You want a good example of an efficiently-lit city? Tucson, AZ.